KCCI-TV News Director Dave Busiek retired December 12th after a more than 42 year career as a broadcast journalist. He spent the last 39 years, 29 of those as news director, at KCCI in Des Moines. He worked for three years before that at WHO radio, also in Des Moines. Busiek talked about his retirement just before his last day, and here is an abridged version of the interview. You can listen to the full interview below. Why did you stay at KCCI so long? I’d never set foot in the state of Iowa until I moved up here, fresh out of college at the University of Missouri. I thought I’d be here for a couple of years. I’d be off to the network somewhere and off to a bigger market. And the fact of the matter is that what I really like doing is hands on good journalism, daily journalism. I learned that I was fortunate, fortunate enough to be at a really good station here at KCCI. We do journalism at a high level, and we’ve been lucky to have good owners during my 39 and a half years here who’ve always believed in journalism. I passed on some opportunities to move to bigger markets because I just realized that I had a pretty good thing here. You put roots down in a community that has been really great to us, to our family and we like it here. We plan to stay here throughout retirement as well because we’re just very happy here. See a photo gallery of Busiek’s career. What is your greatest accomplishment at KCCI? I don’t know if it’s my greatest accomplishment, or if it is the thing that I’m most proud of, is the staff that we’ve been able to hire here. We really just have a terrific staff of visual storytellers. We have photographers who’ve been here 30 years. We have reporters who have been here that long and they’re really skilled at what they do. We have a good mix of young people as well. But I think the thing I’m most proud of here is to have a good eye for smart, curious, talented journalists and to be able to bring them in here and to be able to do good journalism on a daily basis. What is the biggest story that you and your staff have covered during your career? When the Des Moines and Raccoon rivers flooded at the same time, in July of 1993, it knocked out power to all of downtown Des Moines, including the station here and it flooded the Des Moines Waterworks, which meant that just about the entire metro area was without drinking water for 12 days. That was a huge crisis. We were on the air for five straight days with wall to wall coverage. That was probably the biggest and most important story just because we knew that everything we were putting out there, our viewers really needed, really were depending on us for information to protect themselves and their families. What advice do you have for journalists right now? I’m very concerned about how under attack we are. We are not the enemy of the people. We don’t lie. We tell facts and, and this is just common sense. 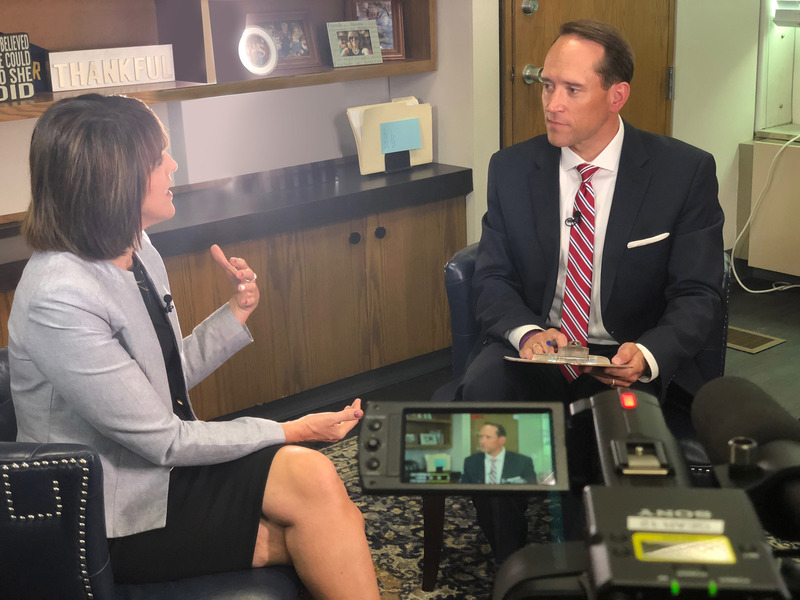 We’ve got to be diligent to make sure that the Americans and our viewers here in Iowa, and our readers, know what we do on a daily basis. We have problems in this country and in this world and we’re never going to solve the problems if we can’t agree on what the facts tell us that the problems are. What are your retirement plans? It’s been a great career, I wouldn’t have changed a thing. I’ve absolutely loved it. But being a TV news director these days is harder than it’s ever been. I’m looking to slow it down a little bit and just enjoy life a little bit. We do have some travel plans. I’m going to play a little bit of tennis. I’ve got a whole bunch of books that I want to read. And, just to try and get in the best shape that I can for an old guy like me. I want to spend some quality time with my wife. I know I’ll get involved in some kind of charitable organization that gives back to the community in some way. I haven’t figured out exactly what that’ll be, but I look forward to that as well. 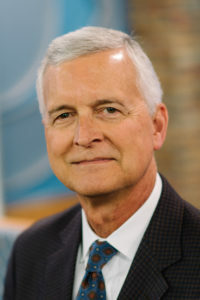 Busiek has been recognized by Broadcasting and Cable as News Director of the Year, has been recognized by the Midwest Television Academy of Arts and Sciences with the Silver Circle Award, was recently inducted into the Iowa Broadcasters Hall of Fame and is a Jack Shelley Award Winner from the Iowa Broadcast News Association. Watch his 2003 Shelley acceptance speech here. Amy Moorman in the archives. 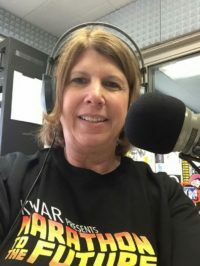 Efforts to preserve Iowa’s broadcasting history recently got a boost with three grants totaling more than $218,000 to the Archives of Iowa Broadcasting (AIB) located at Wartburg College. The money will be used to create an online catalog of more than 28,000 video and audio items in the AIB collection as well as digitize more of the film and tape in the archives. In addition, the money will pay for equipment to monitor the humidity and temperature in the archives storage area, and better containers for preserving the collection’s film. “The end goal is to provide easier access for people to find and view materials,” Amy Moorman, the college’s archivist, said. “That’s why we keep materials, so people can use them,” she said. Besides the recordings, the collection also contains old broadcasting equipment, scripts, letters, memos and photographs from various broadcasters and stations around Iowa. 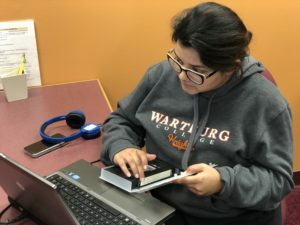 Saima Perveen is one of nine students who work part time in the Archives of Iowa Broadcasting and the Wartburg College archives. Grant Price, a longtime Iowa broadcast journalist and Wartburg College professor, began collecting material in the 1990s and storing them in his office and other places. When Wartburg’s renovated library opened in the late 90’s it included a space for the broadcasting archives, and the college’s archives. It’s important to preserve the materials because they are more than broadcasting history, says another long time broadcast journalist Dean Borg, who is co-chair of the archives advisory board. They are the history of Iowa’s issues and events, he said, and the audio and video add an important element. “Here you’re seeing what radio and television does for you. It brings you the sights and sounds of the news at that time, the facial expressions of the people who were making the news,” he said. AIB advisory board co-chair David McCartney of the University of Iowa agrees. He foresees researchers using the archives to study issues such as Iowa’s politics and economy. “There are all kinds of strands of disciplines that are interwoven throughout these magnetic and film media collections,” he said. Eventually, researchers won’t necessarily have to come to the archives to see the material. Efforts to put materials online are progressing. Currently about 200 video and audio items are online. But in early November an additional 2,200 video stories and newscasts from KWWL-TV in Waterloo were sent to an outside company for digitization. A number of 16-inch radio transcription discs from WHO radio are also being digitized. 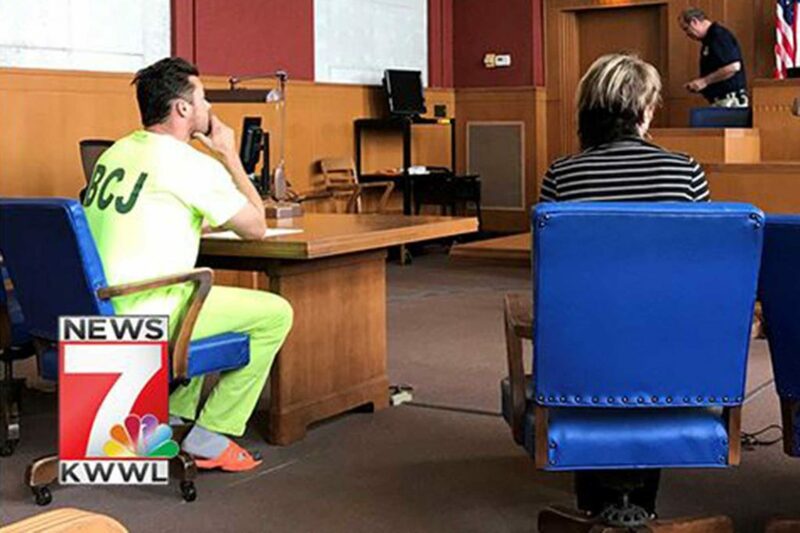 It will be many months though before the materials are online, Moorman said. As for the future, McCartney hopes the researchers will be able to view traditional content, such as paper records from broadcasters and radio and TV stations, online as well as the audio and video recordings. 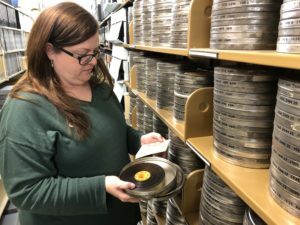 “I think more and more, we hope that the Archives of Iowa Broadcasting will be recognized as a potential historical research resource to tap into,” McCartney said. If you have materials to donate to the AIB, contact Moorman at amy.moorman@wartburg.edu.